The Master of Business Administration (MBA) in International Management is offered at Wittenborg's Apeldoorn and Amsterdam campuses. It allows students to follow modules, or part of modules at either campus, and is taught by an international team of lecturers and researchers from academia and industry. The MBA in International Management degree programme is aimed at students with a business and non-business administration Bachelor degree backgrounds. Candidates will have had at least 3 years of experience working in companies and organizations in a role that manages people or processes, or both. Candidates for this Wittenborg MBA will speak good English and have worked in an international environment. “The Wittenborg MBA degree programme is aimed at providing graduates with the skills and competencies to fulfil management positions in the field of business administration, both in the public and private sector. These positions can include management or policy-making positions in large organisations, as well as positions of management in small to medium sized companies (SMEs). An aim is that students are able to critical analyse and evaluate various developments within an organisation so that they can form, create and instigate policies, visions and aims and solutions within that organisation. They should be in a position to analyse the strategic processes and vision of a company or organisation and using this analysis apply and implement tools to innovate, optimise and (re-)structure these processes using an integral approach. From an international perspective the students should learn to analyse the environment they find themselves in and adapt their behaviour and role according to the macro and micro environments they find themselves in." Starting February 2019, the 'MBA in General Management' and the 'International MBA' programme will be merged into the 'MBA in International Management'. 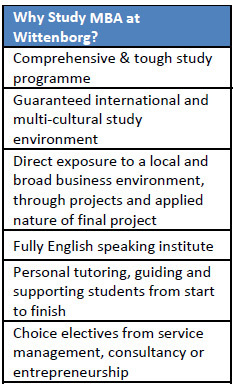 In Semester 1, students follow 6 core MBA modules. These modules incorporate a number of classic functional business administration areas, which, besides by forms of classical delegation of knowledge, will be grasped by reflective learning, i.e. learning in which students reflect on their prior work experience or, in cases of part time students, on their current work and employment organisation in the light of the materials provided in the various modules. Reflective learning helps to develop critical thinking, self-awareness and analytical skills. It involves an individual in a reflective process. Semester 2 sees a series of modules that allows students to study further in-depth in areas of globalisation and strategic management, and also to choose specialised electives in which to deepen their knowledge. In Semester 2, the main modules International Corporate Sustainability and Globalisation, Society & Culture provide more depth and breadth to the programme, looking at global issues from a socio-cultural perspective as well as a business administration one. These modules represent an interdisciplinary approach to the learning process, i.e. 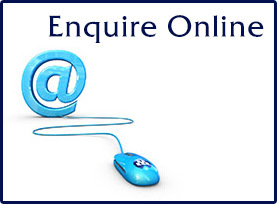 a number of issues will be studied from various theoretical perspectives developed in different academic disciplines The main module Business Statistics looks at the application of statistical methods and data within a company or organisation. It will also prepare students for their research in the Final Project insofar as statistical analysis is a part of it. Similarly, but in a different manner, this module invites the student to combine information from different disciplines and sources so as to reach a full understanding of business-economic and social phenomena. Throughout Semester 1 and 2 students work on a Personal Development Plan (PDP) portfolio that culminates in three interlinked project weeks in Semester 2 in which students work in teams to fulfil a consultancy project for a regional organisation. There maybe 1 or more projects, depending the nature of what is available, and during the PDP and Project Module students are guided by their tutor. Semester 3 is completely allocated to the Final Project, in which students complete a research project, preferably instigated by a company or non-business organisation associated with Wittenborg. The Final Project (at the very least) will combine theory, research and practical application. Within the MBA programme, the Semester 1 modules are basically about classic, ‘functional’ management subjects, however in contrast to the other MBA variants, modules are specifically geared to an international environment. During this semester, Wittenborg will stimulate a cross-functional orientation through cases and discussions about how a module’s subject-matter can contribute to the overall performance of the company and where cooperation between the various functional areas can be supportive to this. In a subject like Supply Chain Management (which in the present MBA programme is part of Operational Management), functional integration is an issue which has to be addressed before thinking of the ‘extended company’ (integrating with other links in the chain). To give another example, the Balanced Scorecard (being part of Management Accounting) can be highly conducive to seeing the links between a company’s functional areas and activities; and because of that can elicit an interdisciplinaryoutlook. Also, a critical perspective is necessary, i.e. it is important to discuss within the context of the various functional areas (covered by the modules as programmed) the issues which are referred to by concepts such as ‘silos’, compartmentalization, poor organizational DNA, organizational myopia and the ‘not invented here’ syndrome. Such discussions promote a vision that exposes departmental thinking and embraces interdisciplinary ideas. The Semester 2 modules by their very nature open up various interdisciplinary perspectives. In particular the modules of International Corporate Sustainability, Strategic Management and Business Statistics are geared at connecting concepts and data of different kinds enabling an interdisciplinary understanding of corporate issues. Other subjects, such as ‘Globalisation, Society and Culture’ present views of corporate and entrepreneurial activity which cut across the narrow boundaries of the traditional disciplinary and professional divides. The 3 Project Weeks in Semester 2 are specially designed to promote interdisciplinary thinking as the consulting assignments given to students by the organisations involved require a broad problem solving, analytical approach, ushering in experience and knowledge from a range of business administration areas, and using a combined approach to offer plausible solutions and strategies. 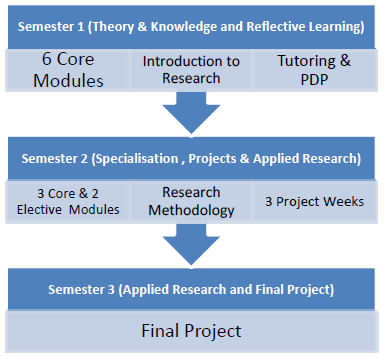 From a student’s perspective, a Personal Development Plan has been set already in Semester 1, during the tutoring sessions, and the optimal aim would be for the three project weeks to be interlinked by creating interdisciplinary themes that run through a main project or interlink smaller projects. MBA graduates are often fast-tracked into senior management positions and this MBA programme has been designed for those who wish to pursue senior management positions or as preparation for further study in business, such as a DBA, or a PhD. International students worldwide, from business or non-business fields, with a proven number of years managing people or processes within an organisation. These students are looking for an English-taught, internationally orientated MBA programme that can allow them to improve their career prospects in the job market either at home or in the Netherlands, either at their current employer or at a new organisation, and possibly continue their studies at a higher level. 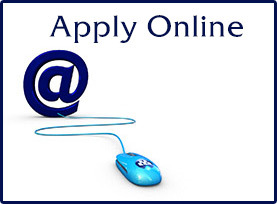 With its work experience requirement, the admission requirements reflect the national requirements in the Netherlands for entry into a professional Master such as the i-MBA. The English language proficiency level requirement is ½ a point higher than the minimum national requirements in the Netherlands. There is no specific selection procedure for students wishing to enter the MBA, however non-EU (visa) students are “screened” according to their background, in order for the institute to be able to guarantee their immigration status. 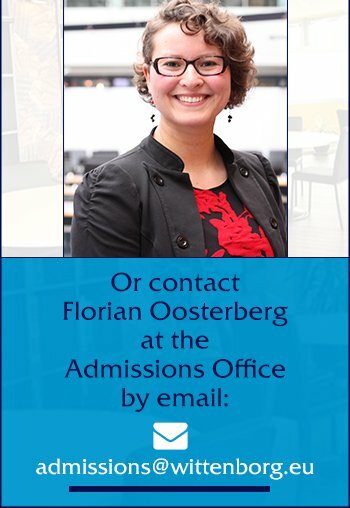 Applicants are required to provide a motivation letter in which they describe the reasons for choosing Wittenborg’s programme, as well as the reason for wanting to study in the Netherlands (international students). Student motivation is important as the programmes are demanding and especially for international students there is a criteria that they complete at least 50% of all their credits in a year.